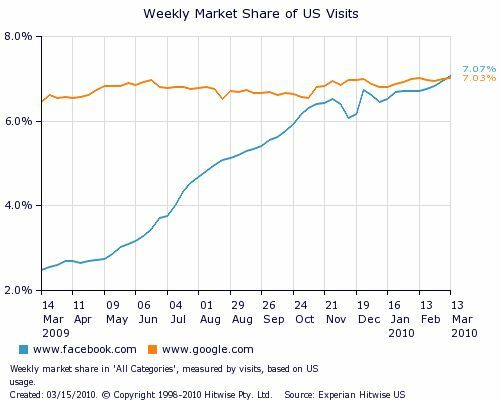 Facebook has overtaken Google (GOOG) to become the most popular website in the United States for the first time, according to new data from Hitwise, which measures Internet traffic. For the week ending March 13, the social networking juggernaut registered 7.07% market share, beating the search giant's 7.03% market share. The new data is sure to unnerve Google, which has been trying to crack into the social networking market -- with controversial results. For Facebook, the data will add further fuel to its push to go public sometime in the next year or two, as CEO Mark Zuckerberg has suggested. 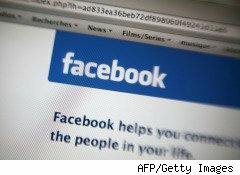 Analysts predict that when Facebook does go public, it could see an immediate valuation of $35 billion -- a figure which could rise to $100 billion by 2015. 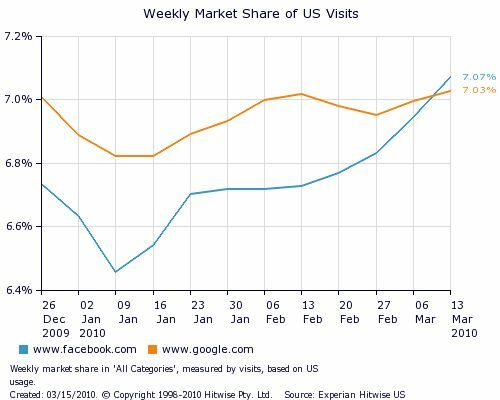 Since December 26, Hitwise's data shows Facebook steadily closing the gap on Google in terms of weekly U.S. visits. Year-over-year data shows an even more dramatic increase. Of course, it's important to put these traffic numbers and charts into context. Google is a giant, $130 billion public company with a fantastically profitable business model that churns out $23 billion in annual sales. Facebook, though huge, is still a start-up in search of a sustainable business model that can justify its current valuation, which is estimated to be anywhere between $8 billion and $15 billion. Even though Facebook has passed Google in terms of online market share in the U.S., according to Hitwise, it faces many more challenges. Simply put, people go to Google because they are looking for something -- the inquisitive act of seeking naturally lends itself to advertising. Whereas people go to Facebook to socialize and share with friends and relatives in an environment in which advertising is viewed by many as an intrusion and a distraction. So while Facebook may have passed Google in terms of traffic, there is little chance it will overtake the search giant in terms of revenue or profit anytime soon.